In this post, I address the trends that I have captured and which, I believe, will impact the future of education. I have clustered them under two main categories. The first one is under “Internet” as the big title that includes all internet based tools and technologies. The second one under the “Education Paradigm” which includes the educational theories, initiatives and movements that are causing paradigm shifts away from traditional educational systems. The Internet is the global technology or concept that is setting the real future trends of education as well as humanity. Since its widespread introduction in 1990, the Internet has been instrumental in paradigm changes in education as well as civilization. 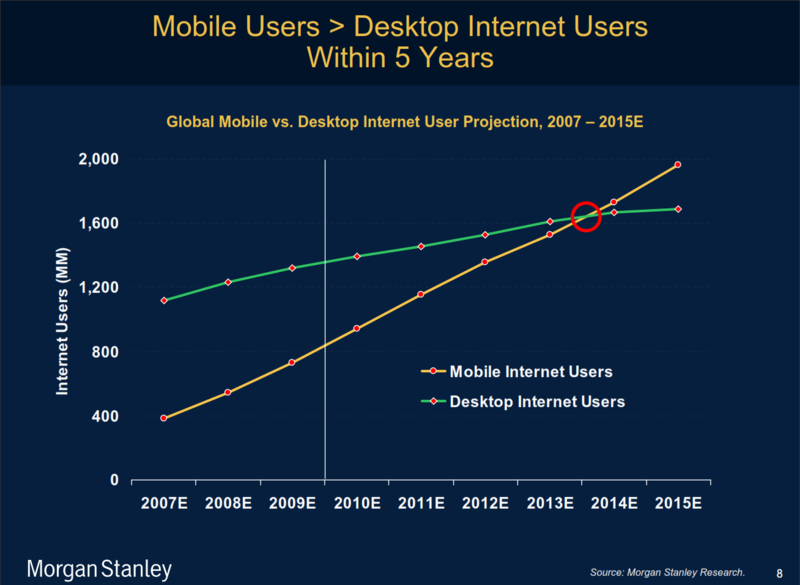 The Internet users across the globe are on continuous increase (Morgan Stanley, 2010). The Internet has become the backbone of modern knowledge generation activities that is impacting education, humanity, the world economy, the social life, the communities and, to some extent, has created its own global culture (Brockman, 2011). Within the internet topic, many sub-trends are emerging that will shape the future of education. Most of these are evolving rapidly and many of them have short life span. However, all of them, rely on the Internet as the backbone technology. 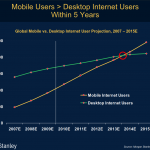 Mobile internet describes the collective trend that encompasses all the devices and services that offer. Originally, mobile computing referred to the wireless phone systems. 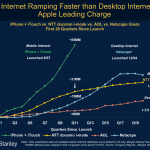 To me, the whole idea of mobile computing revolves around the mobility of the Internet. 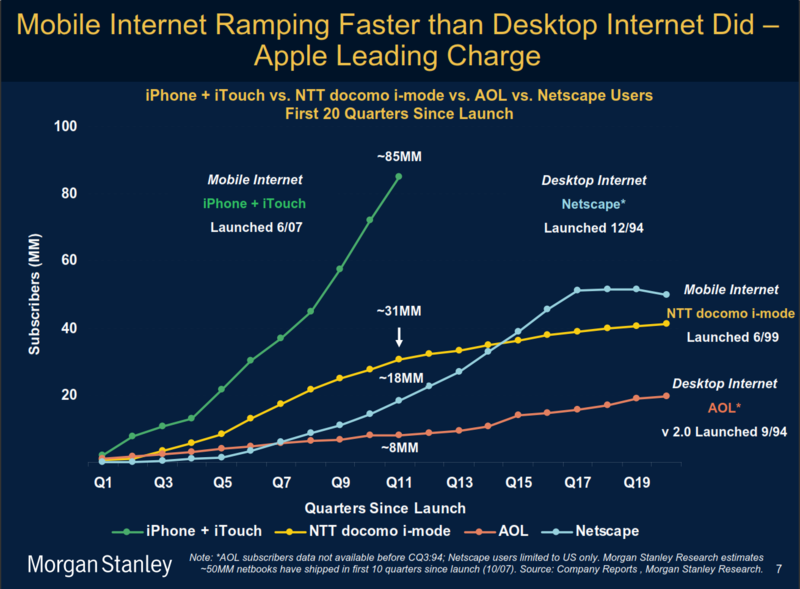 The main milestone in this trend happened in 2007 with the iPhone which was the first device that integrates the fully blown browser based Internet with the phone systems. The concept mushroomed into other devices and services, like Android, that allows individuals to access the Internet knowledge virtually anywhere. A new trend that I believe will have a impact on the popularity of the mobile Internet is the technology introduced with the Amazon Silk (video) browser where the burden of code crunching is elevated from the devise to the cloud. This technology will make the mobile devices more powerful yet much cheaper and affordable by all the masses. Smart Social Media: On a global level, and since 2009, the number of social networking users has exceeded the number of email user which is an indication of its future dominance as the main communication medium (Stanley and Morgan, 2010). In the recent years, the social media started using smart tools that takes it beyond a mere communication into knowledge building and decision making. Some examples are: the Radar feature of FourSquare, Mobili that allows you to use your mobile device to see the world through the eyes of your friends and Whrrl (video) that allows you to use your social friend experience to get suggestions on places to go and even filter down to the types of places that interest you. Augmented Reality: or mediated reality is a set of tool and systems that augments real world elements with computer generated information. This trend has been around for a while, but the introduction of the mobile Internet devices created the real time generation of information and knowledge are generated based on the present physical environment and customized for the user background and information. The most famous tool is Wikitude (video) which is a location-based services and for web enabled phones. Internet Tutorials: The widespread of Internet has brought with it varied ways of helping the students of the traditional education learn. The wide spread of cloud based video streaming like YouTube have promoted online tutorials. Some of them are geared towards traditional academic lessons, like the famous Khan Academy tutorials, others are designed by laypersons for all walk of life tutorials like cooking, construction, photography and so on. The majority of the free tutorials are published by ordinary laypersons. Cloud computing: Finally, cloud computing is catching up to become the mainstream technology infrastructure. It will eventually dominate the IT industry because of the massive investment in it on a global level (Schubert, n.d.). Some of the emerging cloud tools include: The productivity tools, like Google Docs and Office live,the online presentations tool like Prezi, the note taking applications like Zotero, the business applications like Zoho, and the storage solutions like DropBox. The second trend could be categorized under the umbrella of educational paradigm shifts. There is an increasing movement within the educational circles to recreate and redefine many of the educational values and practices to meet the challenges imposed by the emerging technologies. In this section, I list and explain some of these movements that might lead to prospect future. Shift of the focus: In North America, there are some dynamics of shifting the focus of the educational institutions from teaching to learning. That is a shift from “transferring of information through teaching” to “creation of knowledge through facilitation” (Brown & Long, 2006). While in Europe, the focus shifts further than knowledge to “applied wisdom” where learners “use their knowledge in adaptive, responsible and creative ways in new situations. Achieving and mastering such an adaptive competence requires they acquire cognitive, motivational and effective skills to self‑regulate their learning, and get ample opportunities to use and apply their knowledge in a large variety of contexts and problems” (De Corte & Fenstad, 2010 and Sternberg, 2001). Individuality of the Learner: new behavioral theories are emerging that focus on the individuality of the learner. This is resulting in new trends where education is shifting to a new paradigm that individualizes learning based on personal traits. Some of these initiatives are promoted directly in education like Gardner’s Multiple Intelligence (Armstrong, 2010), Robinson’s The Element (Robinson & Aronica, 2009), in psychology through the ideas of positive psychology (Seligman & Csikszentmihalyi, 2000) and in business as the concept of talent (Buckingham & Clifton, 2001). These concepts are being applied in many new learning tools like adaptive learning pioneered by Knewton. Crowdsourcing which is the idea of sourcing tasks to undefined large group of people. This approach have been successful in many areas like Wikipedia, Open Source initiatives and Spring Revolutions in the Arab world. The Gaming industry is using similar approaches to use the “brain grid” of the younger digital generation (Weller, 2011) to find solutions to global problems (McGonial, 2010). In education, the idea is being applied in the Massive Open Online Courses (mooc.ca) initiative were education is open and the mass collaboration promotes the learning of the individuals. Online Learning: An area that overlaps between education and Intenret is the online learning which is showing considerable increase in popularity. In the last 7 years, online course enrollment increase 9% while traditional course enrollment increased 2% only. In 2009, 30% of higher education students took at least one online course (onlinephdprograms.com, 2011). The online learning is taking three different faces: as a blended approach that compliments the classroom teaching, as a distant educations approach and as a self directed study activity. Brockman, J. (2011). Is the internet changing the way you think>: The net’s impact on our minds and future. New York: Harper Perennial. Armstrong, T. (2009). Multiple intelligences in the classroom. Alexandria, Va. : ASCD. De Corte, E. & Fenstad, J. (2010) From information to knowledge; from knowledge to wisdom: introduction. Portland Press Limited. Retrieved from: http://www.portlandpress.com/pp/books/online/wg85/085/0001/0850001.pdf on 24 October 2011. McGonigal, J. Gaming can make a better world: Jane McGonigal on TED.com. ted.com. Retreived from: http://www.ted.com/talks/view/lang/eng//id/799. Accessed on 24 October 2011. Olton DS, Becker JT & Handelmann GE (1979). Hippocampus, space, and memory. Brain and Behavioral Science 2: 313–365. Robinson, K & Aronica, L. (2009) The element : how finding your passion changes everything. New York : Penguin Group USA. S. Marc Breedlove, Mark Rosenzweig, and Neil V. Watson (2007). Biological Psychology: An Introduction to Behavioral and Cognitive Neuroscience. Sunderland, Mass: Sinauer Associates. Schubert, L. (n.d.) The future of cloud computing: Opportunities for European cloud computing beyond 2010. Jeffery, K. & Neidecker-Lutz, B. (eds.). European Commission: Information Society and Media. Seligman, Martin E.P. ; Csikszentmihalyi, Mihaly (2000). “Positive Psychology: An Introduction”. American Psychologist 55 (1): 5–14. Stanely Morgan (2010). Internet trends. Morgan Stanley Research. Obtained from http://www.morganstanley.com/institutional/techresearch/pdfs/Internet_Trends_041210.pdf Accessed on 24 October 2011. Sternberg, R.J. (2001) Why schools should teach for wisdom: The balance theory of wisdom in educational settings. Educational Psychologist 36, 227–245. Weller, M. (2011). The digital scholar: how technology is changing academic practices. New York: Bloomsbury Publications. Good job on your paper, blog post. I want to learn more about using cloud computing technology. I think that is the way the world is going.